A study in the Journal of Education for Business found that full-time Masters of Business Administration (MBA) graduates from Top 50 schools typically have an earning salary that is 50 percent higher than their previous earnings. Additionally, this already high salary nearly doubles over the next five years. An MBA also comes with other benefits besides money. With an MBA you can be a valuable asset to companies, you can change career paths more easily and you can grow your professional network. An MBA isn’t just applicable to business-related careers. This degree is useful in all managerial positions because the knowledge gained prepares individuals for jobs that require a high-level of people management skills. An MBA helps you become a leader in the business community, says Forbes. Plus, you’ll get to meet other people who share your visions and goals, and having a network filled with bright ambitious professionals is a priceless reward since you never know when an acquaintance will become a business partner. Furthermore, according to U.S. News, an MBA makes a difference in two surprising roles: software development and information security. With the wide variety of choices available, an MBA won’t trap you into a career you dislike. Forbes comments that an MBA allows you to make intelligent and informed financial decisions both in and out of the office. Whether you need to analyze a complex business problem or negotiate a monetary investment, an MBA makes it easier. Besides, if you’re already in the business industry, improving old skills and learning new ones is always a good thing. Of course, earning an MBA the traditional way might not be a possibility if you’re currently employed. Luckily, there now are many online schools that provide a flexible learning schedule. One resource for choosing an online program is College Online, which is a comprehensive database of more than 100 online business schools. College Online helps connect prospective students connect with schools, and even gives advice on financing and preparing for going back to school. If you’re interested in starting your own company, an MBA can set the foundation. You’ll be prepared to handle every aspect of a company from its employees to its financial growth. The University of Phoenix mentions that its students are well-prepared to deal with crises since they learn how to handle public relations issues and predict upcoming successes and failures. An MBA exposes you to hypothetical situations, so that when the crisis is real, you’ll be ready. Since not every business professional has an MBA, you’ll stand out amongst the competition when searching for a new job or asking for a raise at your current company. 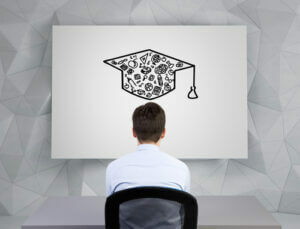 Advanced schooling attracts attention because of its curriculum and because a person who has put the time towards a graduate degree appears responsible and dedicated to employers. Your higher value as an employee means you’ll have a greater chance of being granted job-related benefits such as bonuses, raises and special projects. An MBA might be the difference between another ten years at a company and a pink slip. BrazenLife mentions that the money spent on an MBA could be a bargain compared to the added benefit of job security. The last thing you want is to be replaced by someone who did take the time to gain the valuable skills that come with a Masters of Business Administration degree.